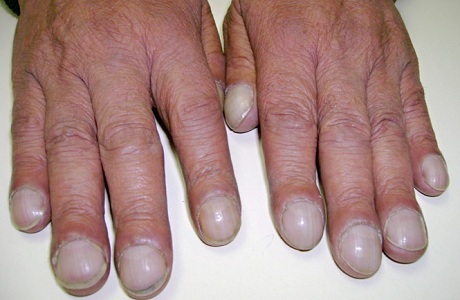 Black streaks on fingernails can be caused by lack of nutrition, injuries, infections, etc. 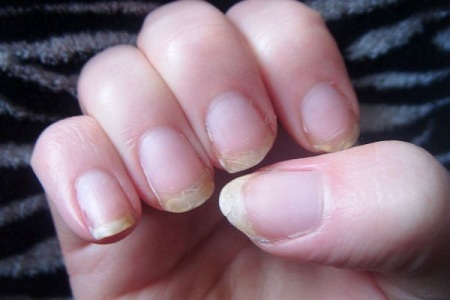 Such changes in fingernails help monitor your health condition. In most cases, you don't have to worry about black streaks in fingernails. That is especially true if the black lines are vertical. Horizontal lines, however, may indicate an underlying health condition, such as elevated stress levels or cardiac problems. Vertical lines can be due to hereditary reasons that don't require treatment, the side effect of rheumatoid arthritis, or the result of nutrient mal-absorption or kidney issues. Why Do Your Fingernails Have Black Streaks? Your nails can give you insight into whether you are receiving enough nutrients, particularly protein and calcium. You may notice white lines on your nails if you have a zinc, protein, or iron deficiency. Mild green or turquois streaks can indicate hypersensitivity or tension. 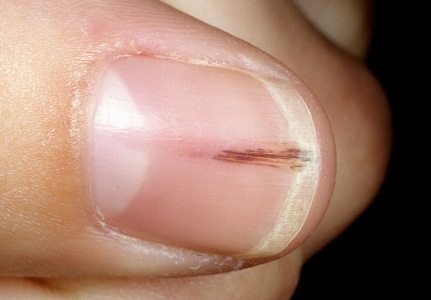 Bleeding underneath the nails is known as a splinter hemorrhage and this sometimes causes black or dark red lines. It can occur due to blood vessel inflammation or capillary damage and affect one or multiple nails. The blood traces may seem brownish or reddish in addition to blackish. You should seek medical attention if the bleeding under your nails is accompanied by serious symptoms like elevated bleeding, bruising, or fever. 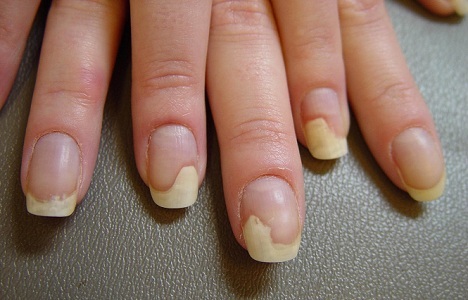 Fungal infections are considered a common cause of black streaks in fingernails. They may also cause your nail to thicken, creating a more obvious or severe deformity within the nail. 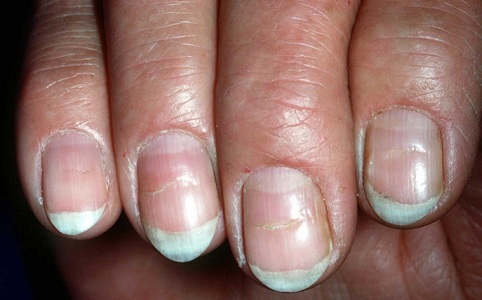 This fingernail condition includes black lines on the nails, nail discoloration, and/or excessive pigmentation. It is most common in those who are older and dark-skinned. It may be due to certain medications, underlying medical conditions, trauma or injury to your nail bed, radiation therapy, UV light exposure, or pregnancy. 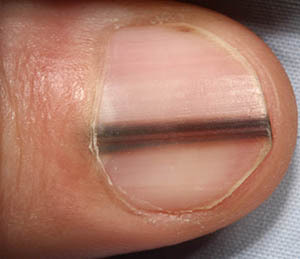 Injuries to your nail may also result in these black lines. They will typically start at the bottom area of the nail before moving upward. It is also possible that the lines form when a wood splinter or other foreign material becomes lodged inside your fingernail. Subungual melanoma is most common in those between 50 and 70. The black or brown band is wider across than three millimeters. The appearance of the pigment band has changed. The thumb is most commonly affected, followed by the big toe and index finger. 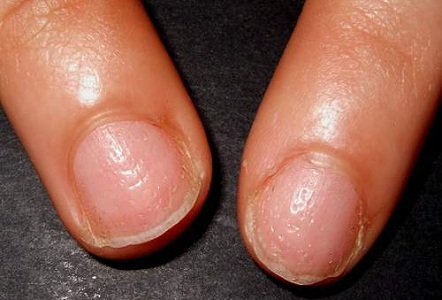 Hutchinson sign or the discoloration extends into the nail fold or cuticle. Your doctor will confirm melanoma with a biopsy. What Else Should You Watch Out on Your Nails? In addition to black streaks in fingernails, you should also look for red or brownish streaks that can look like dried blood. This can indicate the splinter hemorrhages which may also indicate heart issues or just be the result of a random injury. Clubbed nails occur when the toes or fingertips have widened and seem to bulge past your last knuckle and the nails have widened and curved down as if they wrap around the fingertips. They may indicate lung disease, so you should schedule a physical exam for clubbed nails, particularly if you also have shortness of breath or coughing. Spooning or koilonychias refers to little dips in the nail beds that seem to be able to hold liquid. They are typically very pale and remain white for over a minute after being pressed down. This can indicate iron-deficiency anemia. Watch for symptoms like lack of energy, or visit your doctor. 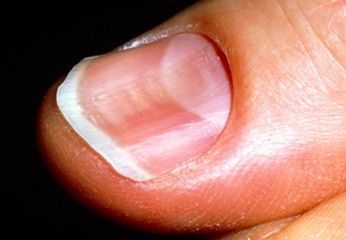 Rippled or pitted nails indicate tiny holes or indentations in the nail bed, which may be due to psoriasis. It can also indicate psoriatic arthritis or in rare cases diseases of connective tissue like Reiter's syndrome. Your doctor can determine the underlying condition and recommend treatment. If your nails are brittle, splitting, peeling, or easily cracked, and have vertical ridges on the surface, you may have an underactive thyroid and the gland doesn't produce enough thyroid hormone. It is usually accompanied by brittle, thin hair and disruption of other metabolic functions. Ask your doctor to check your thyroid hormone levels. If the nail begins to separate from the nail bed, this is called onycholysis and it typically starts on the fifth or fourth fingernails. It also indicates thyroid disease, particularly hyperthyroidism. Too much thyroid hormone leads to excessive nail growth. It is more common in younger patients and is frequently accompanied by difficulty concentrating, weight loss, increased appetite, protruding eyes, fatigue, itching, and hair loss. Beau's lines are white ridges that go across your nail bed's width and can affect one or more nails. 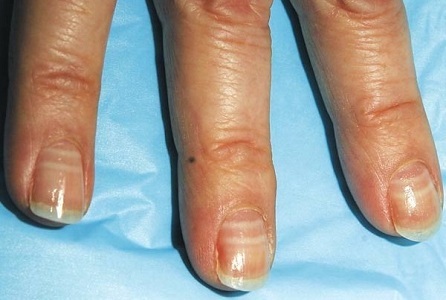 These are ridges within the nail and can indicate diabetes, Raynaud's disease, psoriasis, or nail trauma. They sometimes occur with aging or following chemotherapy or beta-blocker use. Mees'lines are white bands that run parallel across the nails horizontally. Just like the white ridges, Mees' lines can affect one or more nail. This is due to arsenic poisoning but is very rare. Now you know all about black streaks on fingernails and when to be concerned.